Portugieser(Portuguese) is the most popular watch of IWC, on one side, it has the accurate time; on the other side, it possesses a simple but graceful look, so it is very easy to attract much attention. It's origin plays the most important role that contains lengends of beautiful foreign countries and is full of mysteries which gave it the resistless charming. Toelke & King pointed out in his IWC historical book, which was published in 1987, that the IWC had never produced wrist watches but only pocket watches until 1940. In their record, the earlist wrist watch they produced used a pocket watch calibre which was a large aviation watch with a size of 57mm. 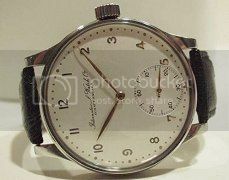 However, Haeffner, a German watch businessman, has a diametrically opposite view, he found an IWC watch, produced in the 1930s, was made of gold, its size is 43mm and its calibre obviously came from a small size pocket watch calibre. 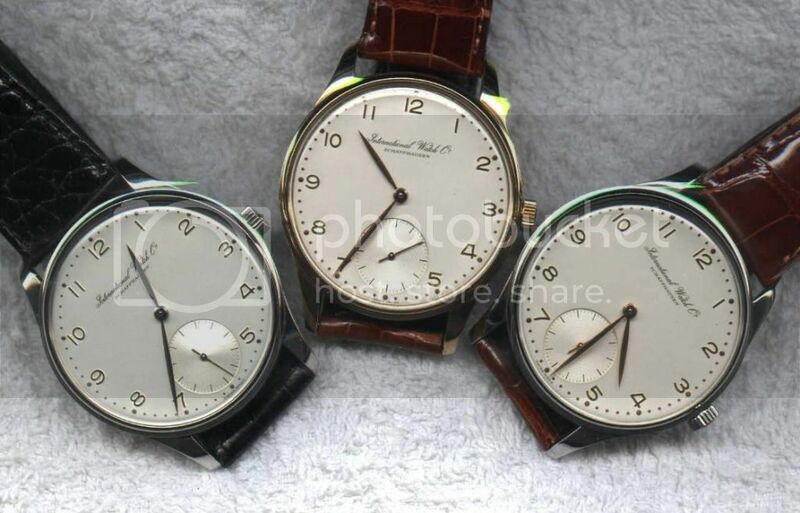 And the Breguet italic index on the silver white dial and the small-second dial at 6 o'clock are apparently similar to the later produced watch called Portugieser. 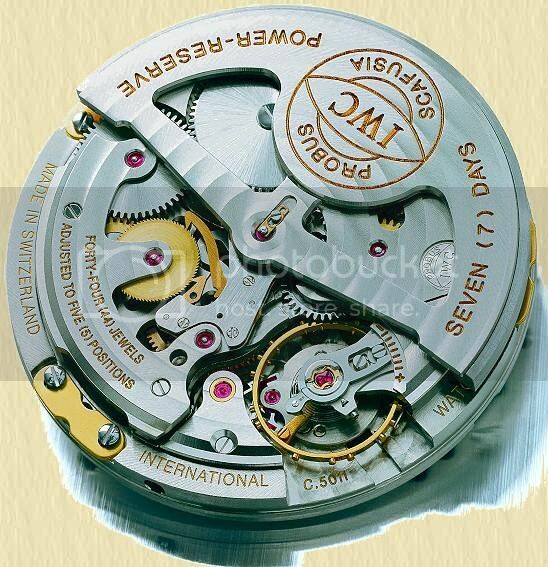 Some arguements about the production history of IWC wrist watches and the so called the origin of the Portugieser occured. 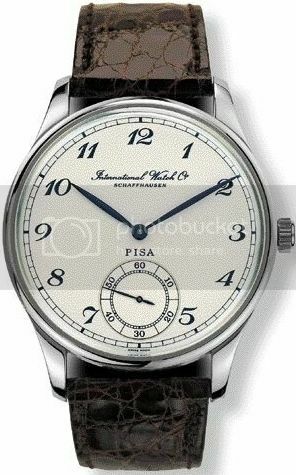 But the history of Portugieser was truely verified till IWC published an official contents of 1995/96 edition: In the late 1930s, IWC received an order came from two Portugal watch businessmen, they are Rodriguez of Lisbon and Teixeira of Porto. They pointed out that hoping to order a batch of wrist watches that possessed the accuration of pocket watch(some experts also considered that this order was from Portuguese navy). So IWC finally selected to adopt the Calibre 74, which was not in prodution since 1931, was the most tenuous(17 ligne and merely 4mm thick) and it is a calibre of pocket watch possessed the accuration of Chronometer. 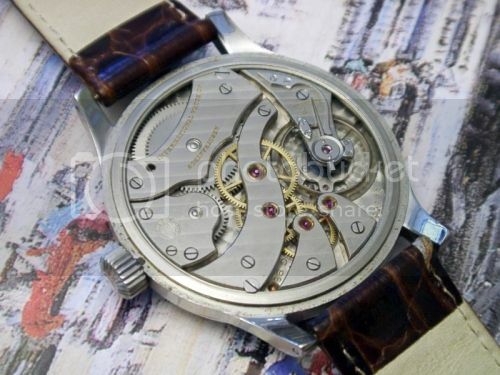 And especially made a classical type of stainless steel case for this movement, that is the famous Portugieser of IWC. No matter on which perspective, this Portugieser with a size of 43mm calibre of pocket watch is an unique and attractive wrist watch. It owned the largest diameter which was diametrically opposite to the fashion of that time. And its case made of unpopular stainless steel. A purely silver white dial with golden swallow hands and Arabic numeral index plus a small second subdial stands at the 6 o'clock established the admirable elegance of Portugieser. Orders from Portugal are intermittently, and low quantity. A trade corporation called Color Metal purchased some Portugieser for selling to oversea besides Portugal. During the 43 years from 1939 to 1981, IWC merely produced 699 Portugiesers, and 304 of these produced watches adopted Calibre 74(the last one was sold out in 1952), another 365 Portugiesers were starting to permute with Caliber 98 and Calibre 982 which derived from Calibre 74 since 1944. Calibre 74 which was originally Savonnette or Hunter type pocket watches and Calibre 73 which was originally Lepine type or Hunter are twin calibres. The crown and small second hand of Calibre 74 formed a 90 degree angle while the crown and small second hand of Calibre 73 formed a straight line. The Calibre 74 had designs of Breguet hairspring, Swan neck fine regulator and Full-bridge was accuracy, delicacy, and it was solid and easy to be repaired. 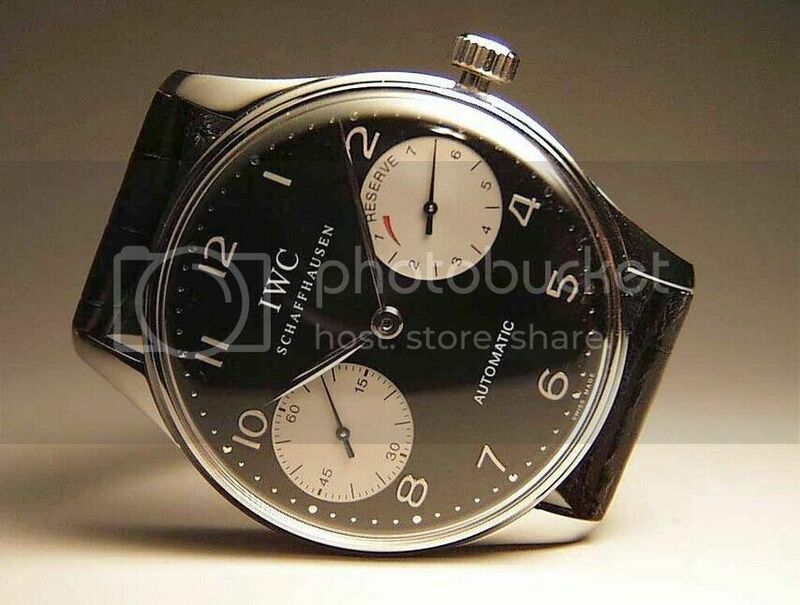 And the reason why IWC would be interested in producing such a large wrist watch which was fully opposite to the fashion of small watch with such a low production at that time? Some people consider that it is related to the inventory of pocket watch calibres. Not to mention whether it was an unintentional outcome, the Portugieser watches which adopted the large pocket watch calibres were unknowingly settled to be the most cherish treasure of IWC in the future. During over 50 years from 1939 that the first Portugieser large watch came out to 1993, IWC had notoriously developed some watches of Mark IX, Mark X, Mark XI, Ingenieur, and the later Porsche Design by IWC and Ocean 2000 which were equipped with admiring Calibre 83, 88 and 89. 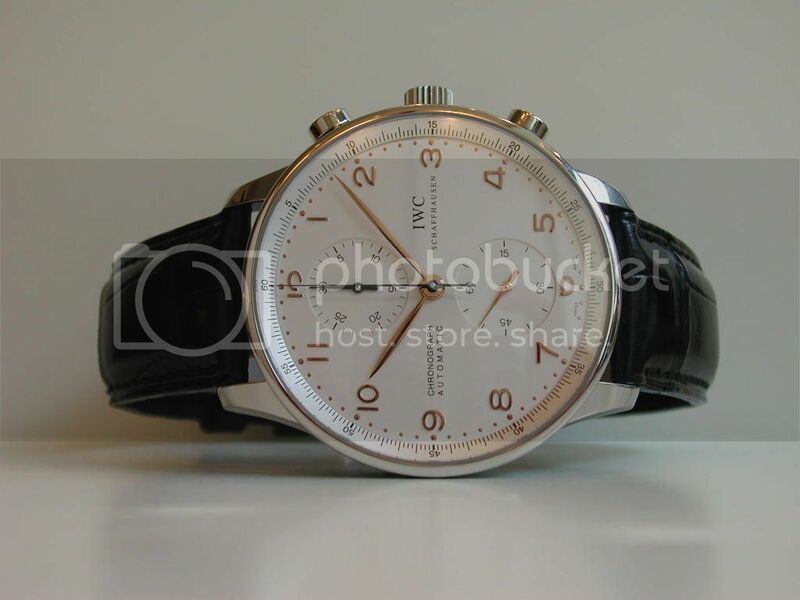 Ceritainly, IWC also produced dress watch of the main size is 34mm(It looks very similar to the Portugieser watch). It can be said that Calibre 83, which fell in between pocket watches calibres and real wrist watches calibres came out in 1930s, like the Calibre 98, it also designed in 6 bridges that seem gracefully and delicately, and it was so strong to be worn in daily life that won one of the most popular calibres. 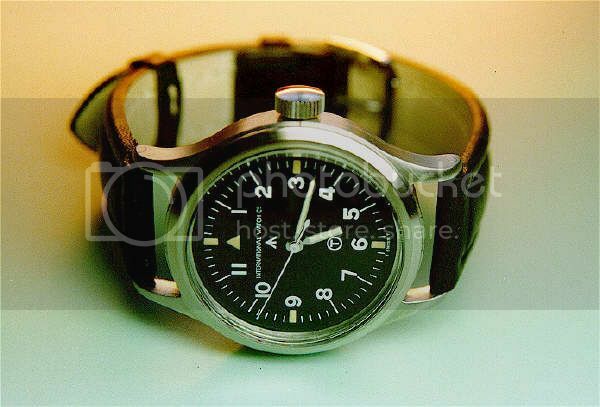 Calibre 83 had been added an antimagnetic escapement and be used in Mark IX military watch, then, had been added a shock-resistance for Mark X military watch. The Calibre 88 and 89, came out together in 1946 after the birth of Calibre 83, was simple, strong and durable even thought its polishment was less micromesh than Calibre 83. Calibre 89 was begining to be deployed in the famous Mark XI since 1947, the production of Mark XI lasted for 30 years and changed to Mark XII. Calibre 88 was used in civil watches that also had a small second hand at 6 o'clock and the dress watches that look like Portugieser. As stated in the previous section, the large Portugiesers with Calibre 74 and 98 pocket watch movement didn't cause an impact in watch industry at that time even after its stop production in 1981. 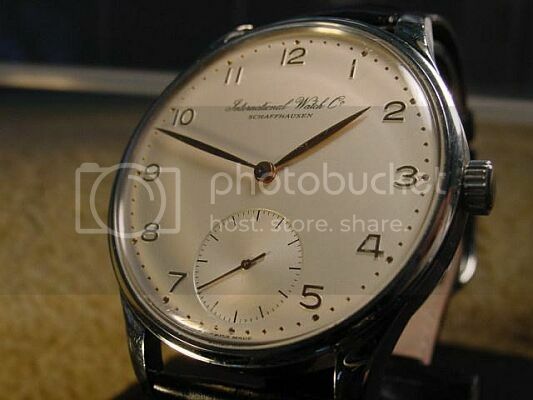 In 1993, IWC issued Jubilee Edition Ref. 5441(Jubilee originally means the fifty years festival of Judaism or the Jubilee of the Catholicism, refer to any events' 50 or 25 anniversary), the memerial limited reissued Portugieser for celebrating the 125th anniversary of the factory establishment, including 1000 stainless steel watches, 500 rose gold and 250 platinum watches. The Calibre 9828 of Portugieser Jubilee Edition was modified from the IWC in-house Calibre 982. To be seriously, Portugieser Jubilee was not a completely re-edition because its movement had been modified and carved, and it featured see-through sapphire back. Calibre 982, which was called the most admirable excellent movement of IWC, possessed swan neck fine regulator and had 18000 bph vibration rate. As soon as the Portugieser Jubilee Edition released, it caused a sensation and was sold out immediately. Portugieser Jubilee not only won the honour for 43mm Portugieser which didn't get the reward, but created a bright future for the large Portugieser of IWC, and guided a fashion standard for Swiss watch-making industry, it was praised as a virgin master work of the large trendency of high level watches together with the Royal Oak of Audemars Piguet in several years. After several years since the Portugieser Jubilee had been launched, a Milan watch businessman called Orologeria Pisa, ordered an amount of 50 Portugieser for celebrating the 50th anniversary of his watch store. After that,the Portugieser issued in 1996 was called Portugieser Pisa and bacame the last product of the set of Portugieser. Be different from Portugieser Jubilee, the dial of the Portugieser Pisa adopted Breguet style numbers and blue steel hands, and the movement had never been carved as the Portugieser Jubilee did. On this side, Pisa Portugieser is more suitable to be called the re-edition of classical Portugieser than the Portugieser Jubilee. 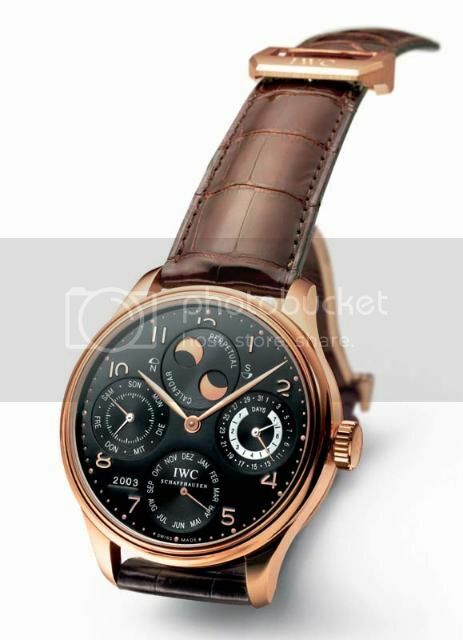 After the high popularity of the Portugieser Jubilee Edition which caused a difficult situation of buying such a watch, IWC quickly launched the Portugieser Minute Repeater Ref. 5240 and the Portugieser Rattrapante Chronograph Ref. 3712(with Valjoux 7760 movement). 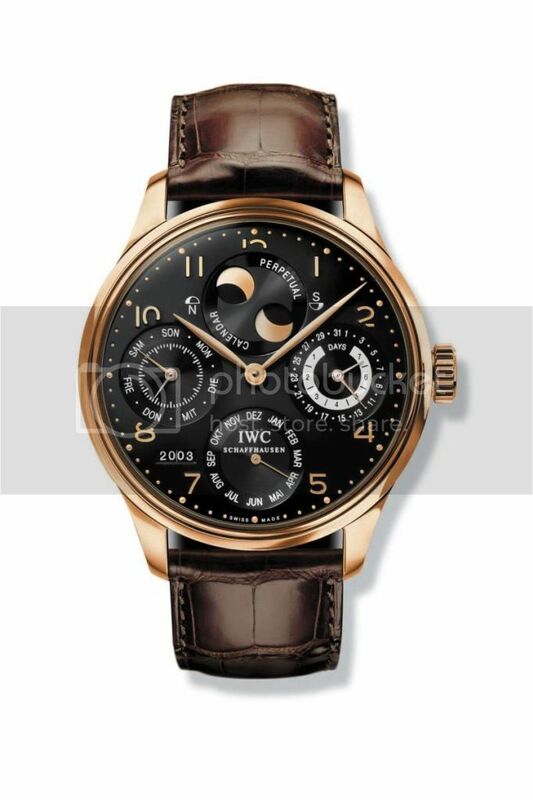 In 1996, IWC launched a smaller (35mm) rose-gold Portugieser watch, the Ref. 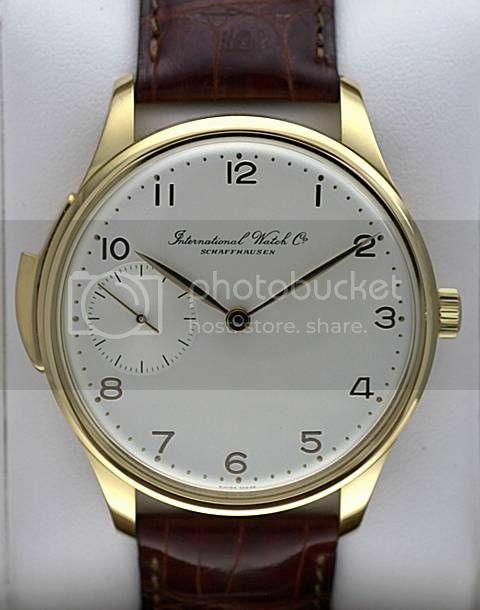 3531, whose movement adopted after the modified Jaeger LeCoultre 891/2. 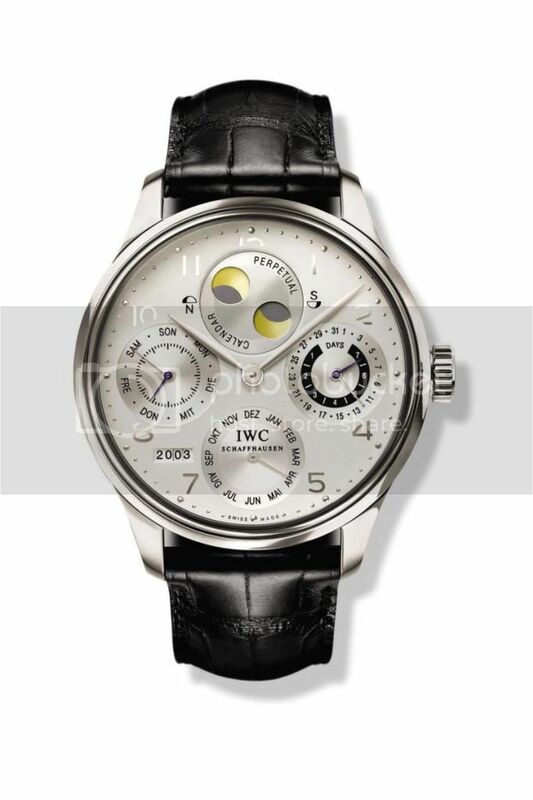 In 1997, IWC launched several Portugieser watches, including stainless steel Ref. 3531, Portugieser Chronograph Ref. 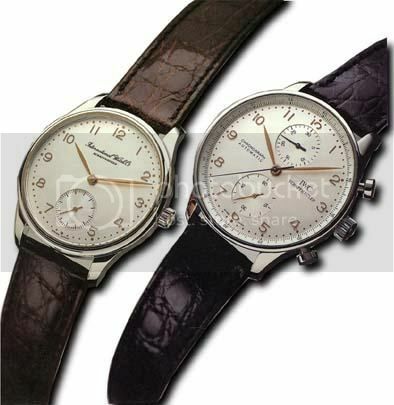 3714 and a 35mm platinum Portugieser which adopted JLC 889/2 movement. 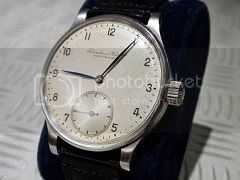 Especially this platinum Portugieser featured a central large second hand and a date window at 3 o'clock. The Ref. 3714 Portugieser Chronograph watch used Valjoux 7750 movement but IWC obviously modified it to fit for its high quality standard, not only the number of jewels increased from 25 to 31, but the movement was added blued steel screws and Perlage. Of course, these new watches released after 1993 had nothing to do with the Portugieser issued in the 1930s, but should be seen as the evolutionary modern edition of the Portugieser Jubilee Edition. 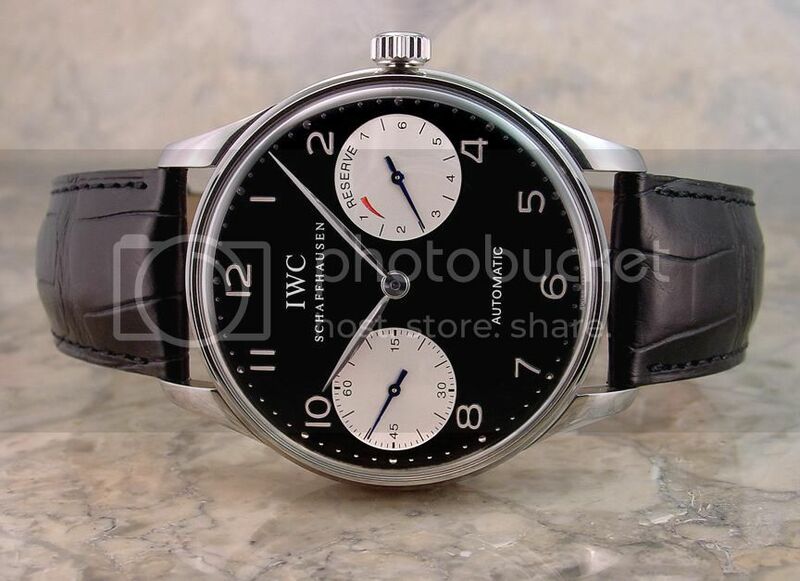 Today,the modern limited edition of IWC Portugieser could be divided into two sets of different sizes: 42/43mm Portugieser with convex sapphire crystal which the smaller type didn't have. Both of these two series possessed the original features of Portugieser, including silvery dial, metal Arabic numeral index, swallow hands and a small second dial at 6 o'clock. 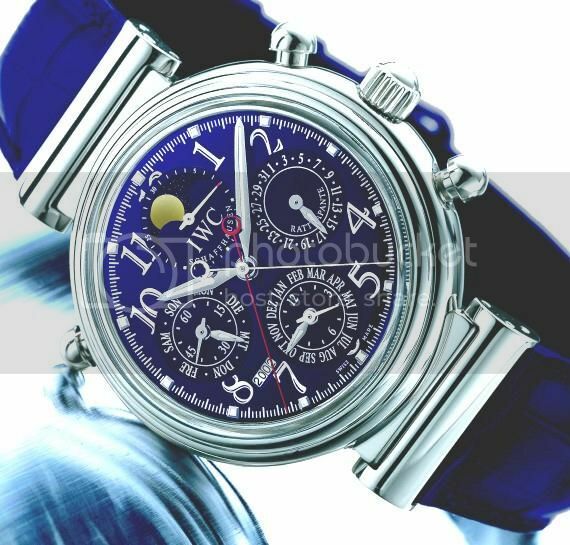 Yonglin Zhong, a famous watch collector in Hong Kong, said: "The quality of pocket watches were higher than wrist watches, so I prefer the big watches to use pocket watch movement. 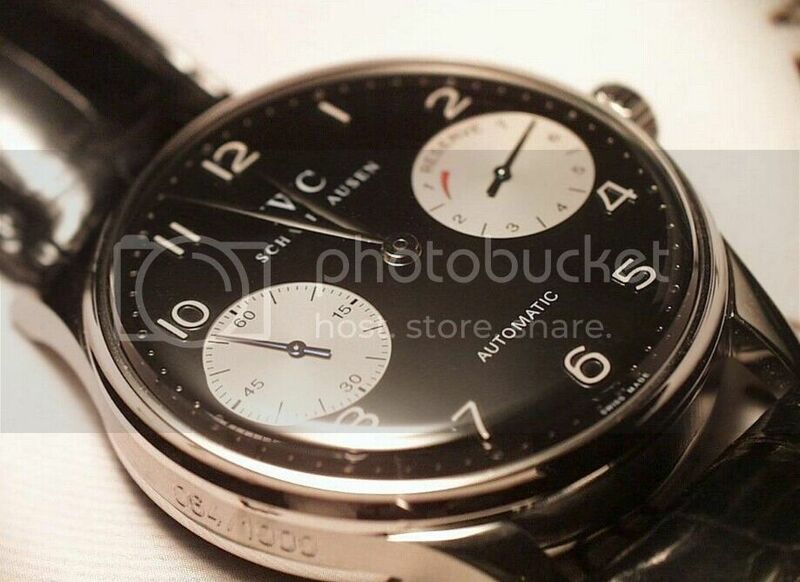 The best model of using pocket watch movement is the Portugieser of IWC. Most people couldn't identify the real treasure, they the smaller 35mm version more." Although it didn't use its pocket watch movement any more, the modern Portugieser today still has accuracy and a delicate texture of focusing on details. The biggest feature of Portugieser is the excellent collocation of its performence and beauty: the large dial and the performance of Chronograph made Portugieser sporty and casual. The silver white dial and noble metal Arabic hour markers made Portugieser elegant.  The more fantastic thing is that these two features integrated skillfully, which presents an unique quality feel. Compared with other current chronograph watches that use metal bracelet, black dial, luminous hands and markers, the type of classical Portugieser dress chronograph particulary presents its uniqueness. The whole feel of smaller Portugieser is a bit similar to the classical dress watch in the 1960s, the distinction is the Portugieser used Arabic hour markers. The expression which IWC treasures Portugieser not only presents in its past glories, but also lies in the sustainable improvement of its quality. IWC had launched 2000 limited edition of Portugiesers in 2000, including 1000 pieces in stainless steel, 750 rose-gold and 250 platinum models, they are all equipped with the Calibre 5000 that took IWC 4 years to research and manufature, this showed its determination and purpose. The excellent performance of power reserve system almost is the greatest part of Portugieser 2000. The Calibre 5000 it used, has the unique bidirection Pellaton winding system(as its drag hook structure like a woodpecker, it also nicknamed "Woodpecker") and a stretched barrel that can be transformed to power by light wrist swinging, and the power can last for 7 days. 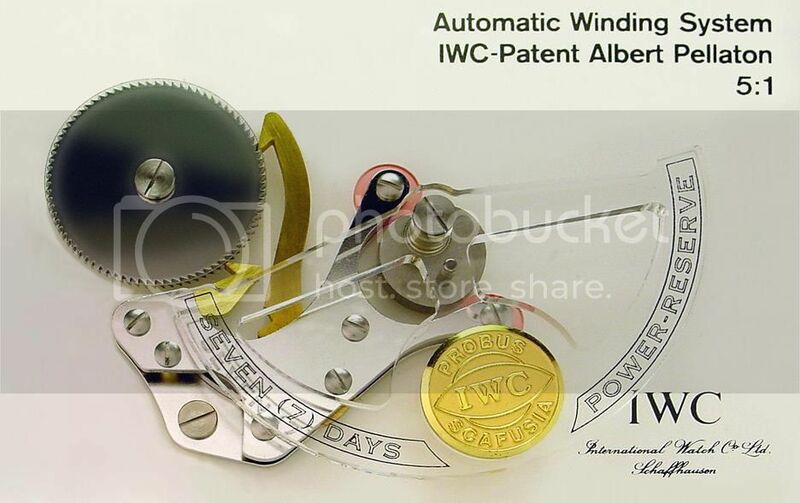 This self-winding system was invented by Albert Pellaton who was on the position of CTO of IWC from 1944 to 1966. And it was one of the most important inventions after the Perrelet self-winding system was invented by Abraham Louis Perrelet, and IWC had applied its patent. The winding system designed by Pellaton could ensure stable power supply, and it was once used in the famous watches, such as Yacht Club and Ingenieur. The mechanical structure of Calibre 5000 can transform the rotation of the gears to power in high efficiency. So it can be wound by wearers' light movement. The symbolic watch Portugieser 2000 that was launched in millennium adopted Pellaton winding system that made Portugieser present an unique charm in the new century. 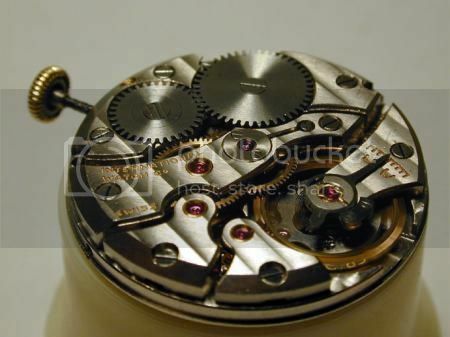 The strengthened mainspring of IWC Calibre 5000 can originally store 8.5 days or more than 200 hours power, but in order to avoid the escapement inaccuracy caused by mainspring fatigue, the movement itself was equiped with one escapement regulating valve, two regulating wheels and one gear equipment that is made of Breguet hairspring and used in Pilot's Watch Mark XI, it would stop operating after the power reserve of the watch had persistently used up for 168 hours or 7 days later for confirming the Portugieser 2000 would keep accuracy all the time. The dial of the Portugieser 2000, Breguet-type Arabic numeral hour markers and swallow hands all inherited the features of Portugieser. The distinction is that the small second subdial is at 9 o'clock position and the subdial at 3 o'clock is a power reserve indicator. 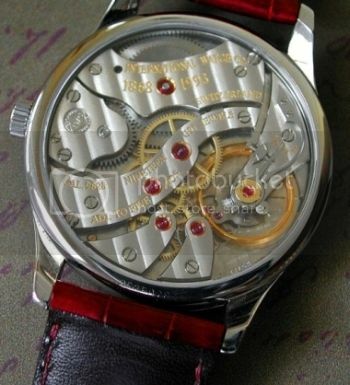 The 44 jeweled Calibre 5000 consisted of 286 parts and could be seen through the sapphire crystal caseback. 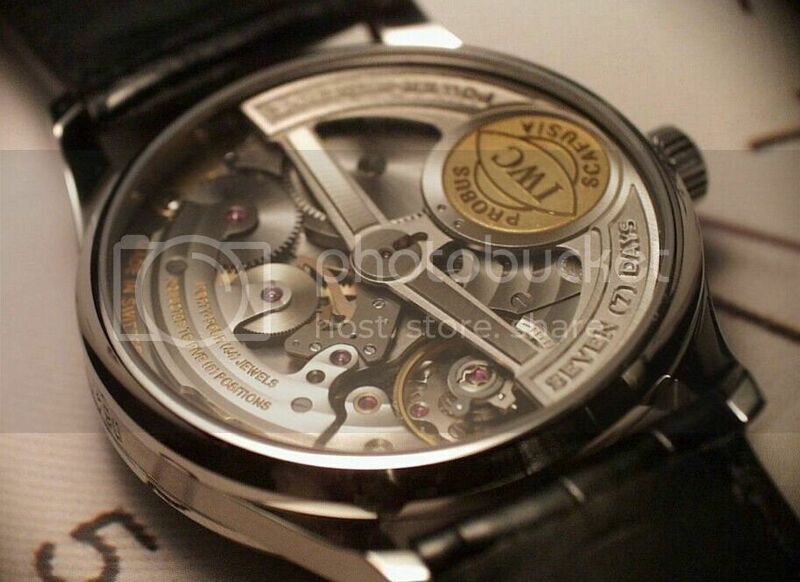 The insignia Probus Scafusia that stood for IWC highest skill was engraved on the auto rotor. Perpetual Calendar must be the best choice for paying respect to Portuguese that was produced 60 years ago. The newest Portuguese Perpetual Calendar that was launched by IWC in 2003, not only kept the traditional features of Portugieser, but also added many special watch-making skills which IWC was proud of. The most admiring part of Portuguese Perpetual Calendar Ref. 5021 is its Calibre 5011 movement, which evolved from Calibre 5000 and integrated with the two most outstanding designs: one is the large movement that was once used in Big Pilot and Portugieser 2000, it had Pellaton self-winding system and 7-day power reserve; the other is the Perpetual Calendar that was invented by Kurt Klaus, a genius in IWC watch-making history. To the watch fans of Grande Complication, Da Vinci and GST, they shouldn't be strange to this Perpetual Calendar that firstly appeared in Da Vinci and Ingenieur watches in 1985, especially its unique 4-digit year diplay and the accurate moon phase whose error is less than one day for more than 126 years. The Calibre 5011 in Portuguese Perpetual Calendar was developed from Caliber 5000 IWC Schaffhausen, besides super high performence of power reserve, the second hand on the dial of Calibre 5011 has been changed from small second hand to central big one, and added date display, which played an important role in Caliber 5011. Da Vinci has 82 components for adjusting the date, while Portuguese Perpetual Calendar needs more middle-size gears for its large diameter of dial, so the components were increased to 109. Less power is needed for the operation of date, so its influence on the power reserve could be ignored. The strengthened mainspring of the Caliber 5011 can reserve more than 200 hours power, it has the same gears system as Caliber 5000 and can limited the power reserve within 168 hours or 7 days to avoid mainspring fatigue. As you can see in the picture below, the power reserve and date are all displayed at 3 o'clock on the dial of Portuguese Perpetual Calendar. The remaining power reserve is displayed on the inner black ring and indicated by a shorter hand, while the outer silver white ring is displaying the date, this design makes the wearer feel very convenient because of the large dial face.